Remember the whoops and hollers when Apple announced it would allow iPhone software updates over the air? Well, this weekend NASA is attempting something a little more impressive. 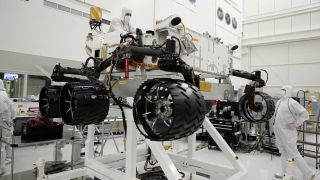 Naturally, the computers on Curiosity were equipped with software tuned to landing on the planet's surface, but now they'll be updated with software more suited to exploring. The upgrade will activate the robotic arm and will incude improved image processing software to help Curiosity avoid oncoming objects. "We designed the mission from the start to be able to upgrade the software as needed for different phases of the mission," said Ben Cichy of NASA's chief software engineer for the Mars Science Laboratory mission. "The flight software version Curiosity currently is using was really focused on landing the vehicle. It includes many capabilities we just don't need any more. "It gives us basic capabilities for operating the rover on the surface, but we have planned all along to switch over after landing to a version of flight software that is really optimized for surface operations." It may be time to stop being impressed when Apple or Google gives us a slightly-improved new version of their operating systems over Wi-Fi.